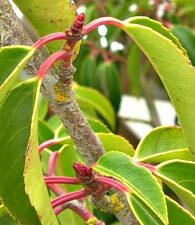 In February, 2007 the laurel plants below had sickly yellow leaves with lack of growth. 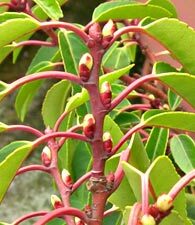 In the first week of April, 2007, the “Volcanite” treated laurel had buds all over the branches, even blooming with healthy green leaves, while the other laurel tree showed little development. 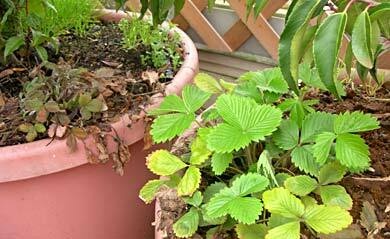 The strawberry plants (below) were in the same big pot as the laurel above. The strawberry plants, in winter stage, looked all but dead. Only about 1% of “Volcanite” was applied to the top soil of the strawberry plant (on the right) in early February. This strawberry plant showed dramatic development, even blooming with healthy green leaves. The untreated strawberry plant (on the left) still had not shown any signs of spring recovery from winter. The treated strawberry plant showed dramatic development, even blooming with healthy green leaves. 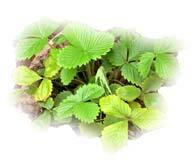 The untreated strawberry plant still had not shown any signs of spring recovery from winter.